My husband and I have been debating for months now on which home project to work on. Our options were redoing the yard, finishing remodeling the basement or to remodel the entry and exterior of our home. We finally decided to move forward with the exterior so that we could have happy thoughts when we pulled into our driveway. We have a basic brick rambler with outdated siding in desperate need of an update. 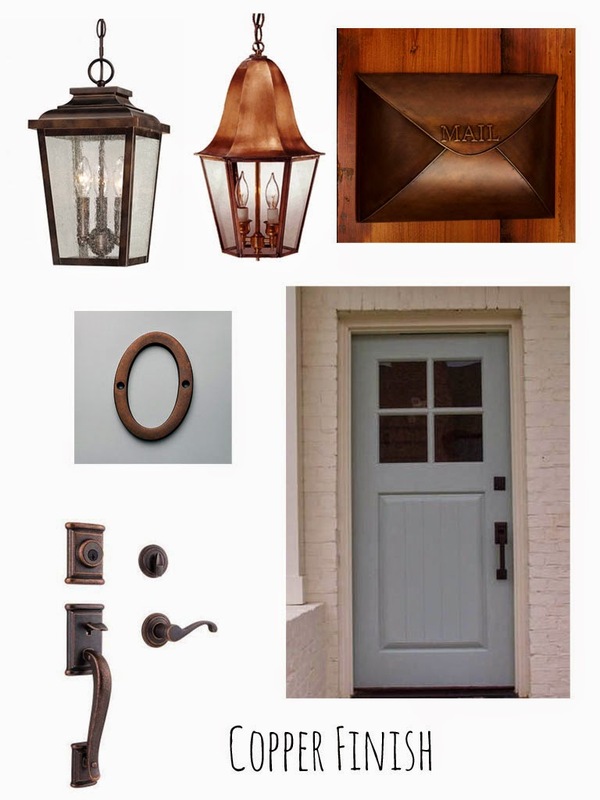 Ever since we bought our house about four years ago, we have wanted to hang Hardie Shakes in place of the vinyl siding, paint the brick, buy a new front door and redo the entry overhang. Now it comes down to decision time which for me is hard in a pinch because I want everything to look good on a budget! 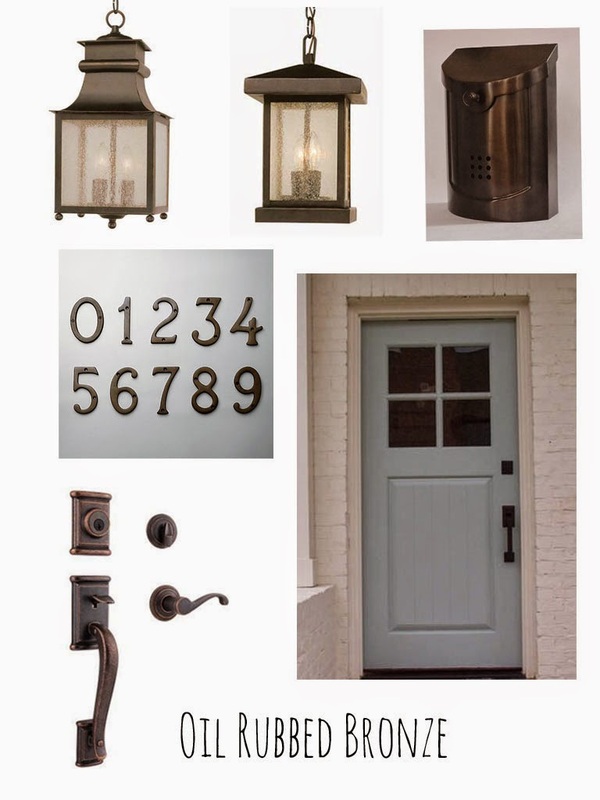 I've narrowed it down to three looks with different hardware finishes. I'm leaning towards the oil rubbed bronze. 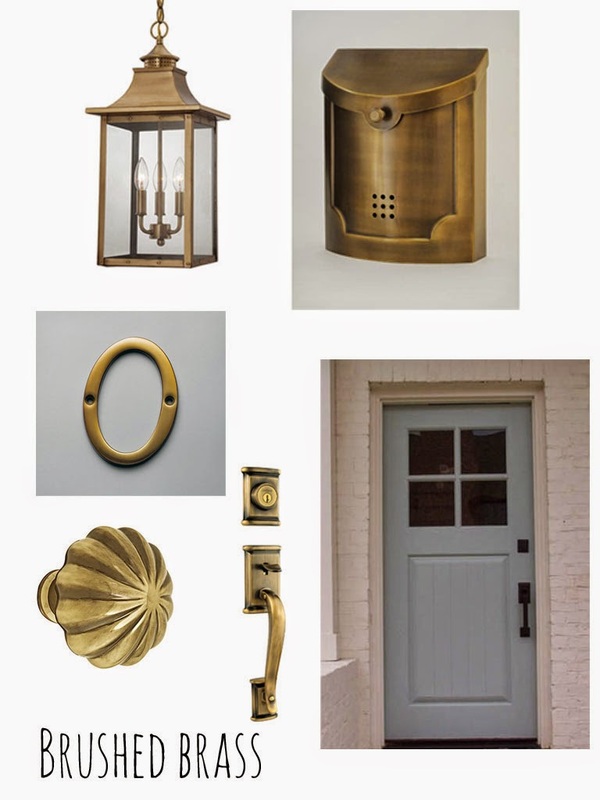 I love the brass but with our brick being painted a light color, I think it would be washed out. 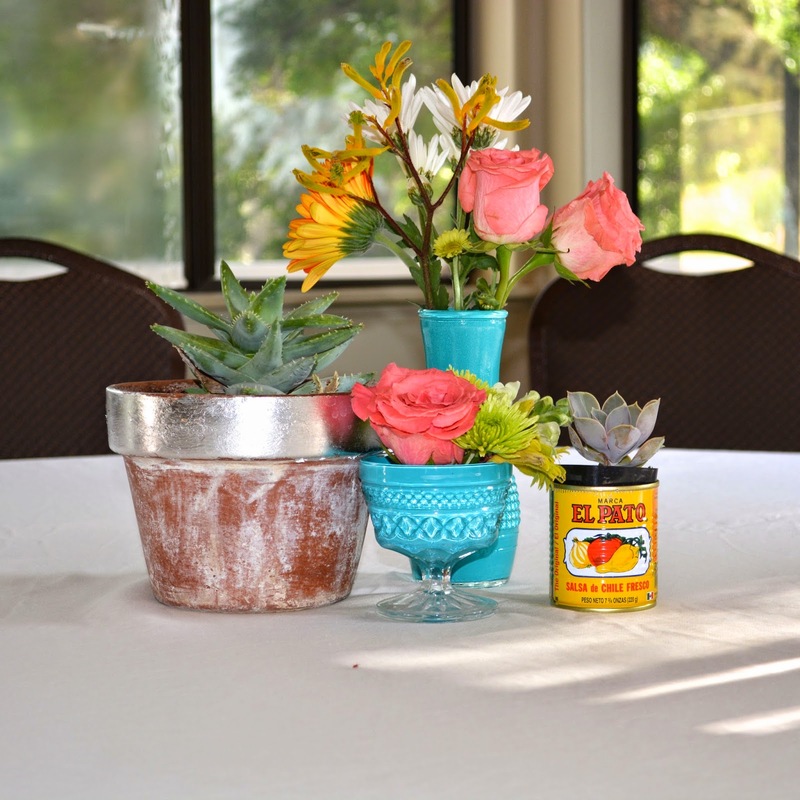 As promised, here is one of the DIY projects from Betty Carroll's birthday bash! I wanted to add some color but was on a tight budget. I was so excited when I came across this idea on Pinterest. It is so easy and really added that pop of color I was looking for. I put the kids to work and it was our family project one Sunday afternoon. 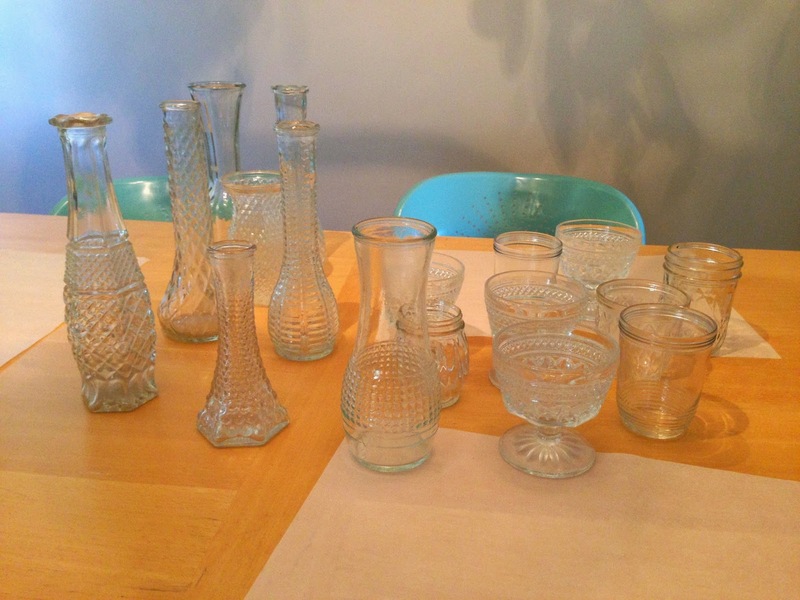 Glass vases and bottles are so common at second hand shops. I bought all of mine at our local Savers and Deseret Industries. They were less expensive at Deseret Industries. I paid anywhere from .25 - $2.00 depending on the size and style. I bought my enamel paint at Michaels craft store. There were lots of colors available and I ended up buying 3 different colors and mixing them to get the hue I was after. Start by making sure you wash and dry all of your vases so theres no dust or leftover grime from sitting on the shelf. Then get the enamel paint you purchased. Make sure its enamel paint because this is made for glass surfaces. If you use acrylic paint, it will flake and make a mess! The paint I purchased was really thick so I actually mixed a few drops of water in first. You will then want to squirt or pour the paint into the vase and roll the vase around until all of the interior surfaces are covered with the paint. 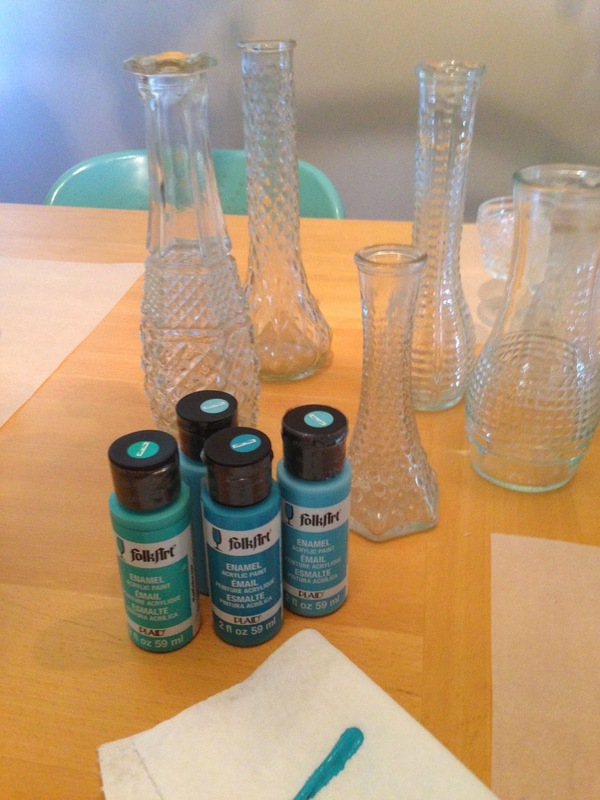 Make sure and pour out any excess paint into the next vase you will be working on. Set this one aside and move to the next vase. 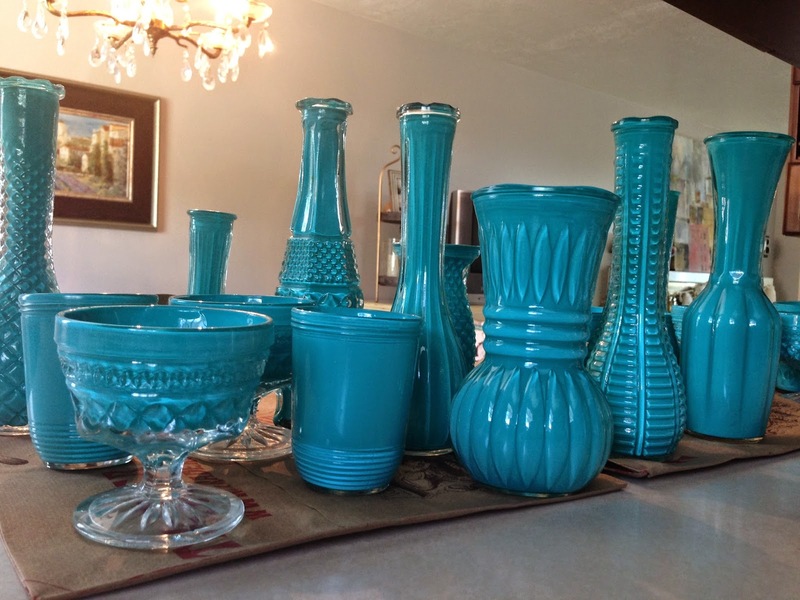 Continue in this pattern until all of your vases have been painted. Once this is done, you will want to dump out any excess paint once again because you don't want it puddled in the bottom. You then need to let the vases dry for about 48 hours to make sure they are completely dry. I did put water in mine for the flowers, however the paint did start to bubble by the end of the night. I dumped the water out and let them dry again and they seem to be fine. I don't think water in general is a good idea though unless for a short period. Good luck on this project and enjoy!